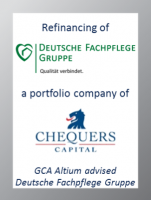 GCA Altium acted as exclusive financial advisor to Deutsche Fachpflege Gruppe, one of the leading non-clinical intensive care providers in the German market, which is majority owned by Chequers Capital. DFG is a market and quality leader in non-clinical intensive care in Germany with approximately 3,200 employees. DFG currently operates via 18 home care services and one non-profit facility, and cares for patients throughout Germany both in individual or care group settings. Following a capital increase advised by GCA Altium in 2016 the company intended to subsequently refinance its existing debt in order to optimize its financing structure as well as gain the necessary flexibility for its growth strategy. In a time-critical (driven by add-on acquisitions taking place in parallel) and competitive process which was focused on alternative lenders, an attractive financing package could be obtained setting the base for future growth and giving DFG the possibility to benefit from the increasing trend of market consolidation. GCA Altium provided debt advice to DFG on all commercial aspects of the financing transaction and secured a competitive financing package, which reflects the company’s specific requirements.